Sony Ericsson introduces the new W995 multimedia phone which is a perfect blend of music and imaging. The Sony Ericsson W995 has a display screen measuring 97 x 49 x 15 mm which is one of the prime features of the phone. The phone comes in three distinctive colors – Cosmic Silver, Energetic Red and Progressive Black. Sony Ericsson W995 comes with an excellent Cyber-shot camera lending it to 8.1 megapixel triumph. The ample 2.6 inches provides sharp and clear images at QVGA resolution. The camera comes with built-in features like face detection, auto focus, LED flash, Geo-tagging and image stabilizer. 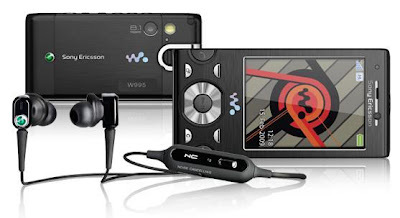 Sony Ericsson W995 also comes with the latest Walkman 4.0 player with Shake control and SenseMe which enhances the user interactivity. Sony Ericsson w995 comes with an excellent battery with a stand-by up to 370 hours and with talk time up to 9 hours. Sony Ericsson W995 comes with other key features that include Stereo FM radio with RDS, YouTube application, Kickstand, Voice memo/dial, Bluetooth 2.0 connectivity, GPRS, WLAN, EDGE and TrackID music recognition. The 3.5 mm audio jack gives the phone superb sound quality. The friendly size and weight is the great asset with metal finish making the phone look stylish and slim. Sony Ericsson W995 is the best choice for the users who are looking for some great music and crisp clear imagining.